Hilton Head Magazines: CH2/CB2: Bluffton Sunset Party Series Continues with Brews & Blues on the Bluff. A Rockin’ Blues & Brews Food Festival, Brews & Blues on the Bluff will be held at The Bluffton Oyster Factory Park on Friday, June 12, from 5-9 p.m. The festival will feature rock and blues performances by Craig Coyne and The Brotherhood of Blues Band. Local restaurants and vendors will serve up BBQ, burgers, wings, seafood and other tasty treats. The Brews & Blues on the Bluff Craft Beer Garden will offer more than 30 beers. “Our craft beers come from all over the world and range from light to heavy to satisfy all tastes,” explained Mark Weisner, event coordinator. Bluffton Sunset Parties are held once a month on Friday Nights during the summer from 5-9 p.m. at The Bluffton Oyster Factory Park on the May River. Each sundown celebration features a different theme with a variety of activities, local foods, craft beers from around the world, and home grown music. You can party with your pooch at these kid- and pet-friendly parties, which benefit the Palmetto Animal League, a no-kill animal rescue and adoption organization serving homeless animals in the Lowcountry. Activities for children include face painting and a Kidz Play Zone. Admission for each Bluffton Sunset Party is $5 at the door; children 12 & under get in free. Everyone is welcome. Come by boat, bike, or golf cart. Lawn chairs and leashed pets are permitted, but no outside food or drinks will be allowed. Blues & Brews on the Bluff is presented by Kroger, Bud Light, River Dog Brewing Company, Coastal States Bank, Hilton Head Lexus, Mosquito Nix, Vineyard 55, Stone Horse Importers, 104.9 The Surf, I2 Recycle, and Bare Foot Wines. 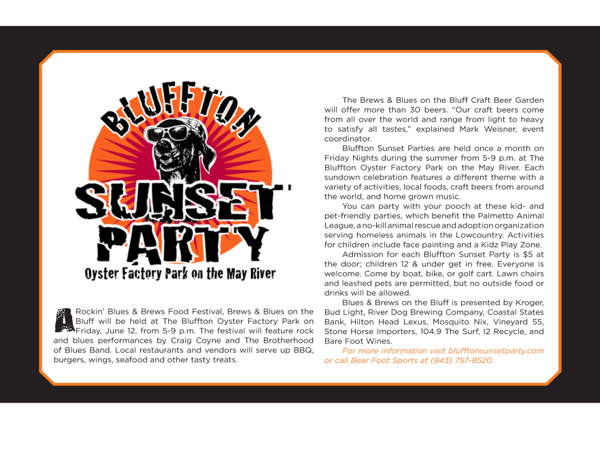 For more information visit blufftonsunsetparty.com or call Bear Foot Sports at (843) 757-8520.